Sometimes you may want to monitor file access to the computer system, for instance after installing a new program to check if and how it interacts with data on the hard drive. Moo0 FileMonitor is a free file monitoring software for the Windows operating system. The program is available as a portable version and installer. File access is monitored on all hard drives by default, with options to filter the storage devices and file access operations at the top. It is for instance possible to select a specific drive for monitoring, and select one or multiple file operations. Available operations are file creations, modifications, renaming and deletion. A user could use the program to monitor file creations on the c: drive, or file deletions on another drive. The program displays all operations in its main interface, sorted by time, with options to stop and resume the recording of data at anytime. Table headers are available to sort the recorded file operations by time, type of change, file name, size, folder or extension. Statistics and additional controls are displayed in the footer of the program. The disk usage is displayed as a percentage value and a graph, and the read and write bandwidth is displayed there as well. It is possible to save the recorded information to a log file in HTM format, to process it in another application at a later time, or as proof of the changes on the system. The View menu contains options to change the file monitor's update frequency, from the resource intensive real time monitoring to one minute or more. Logs are also limited by 2000 entries by default, which can be changed to a value between 100 and 20000 in the View menu as well. 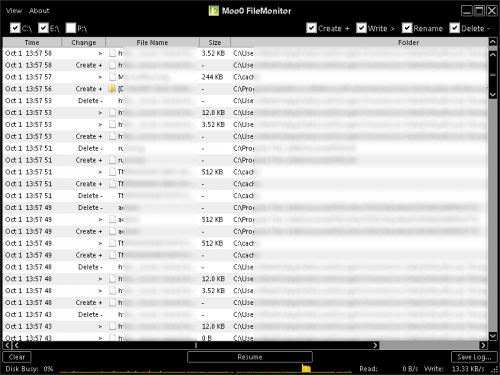 Moo0 FileMonitor could use filtering options, to monitor only specific directories or exclude directories and files from being monitored by the application. A search would also come in handy. The file monitor is compatible with most 32-bit and 64-bit editions of the Microsoft Windows operating system. Both the portable version and the installer are available for download at the developer website.